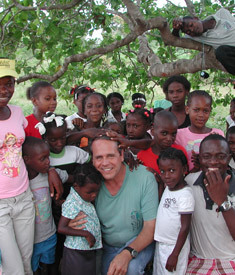 "If Job weren't in the Bible, I probably wouldn't be a Christian," says Aslan Youth Ministries co-founder Craig Bogard, whose personal tragedies have not stopped him from ministering to the needs of kids in the poor communities of central New Jersey and Haiti. Craig and Lynn Ann Bogard grew up in a small, predominantly white community in New Mexico but sensed a call to minister to African-American youth in central New Jersey after a short-term mission trip to the area in the early 1970s. Thirty-five years later, despite living through periods of relying solely on God for their next meal, the Bogards are still at it. They have faced the kinds of challenges that only a deep and abiding faith could pull them through -- fundraising struggles, misunderstandings about their motives by both blacks and whites, and, most recently, the untimely deaths of their two beloved sons, Danieél, 28, in 2004 and Dustin, 25, in 2007. I've been aware of the Bogards' Aslan Youth Ministries for many years, but only just met Craig Bogard (right) last month. As I listened to this slight, serious man recount Aslan's history, what I really wanted to know was: How do you keep ministering to other people's children when your own were taken from you? Craig says he asks himself that question every day, and did so that morning before our interview. The still-grieving father opened up to me about his new life of "pain management" after I told him about the death of my own child. We shared our thoughts on the bittersweet experience of ministering to children who come from seemingly hopeless situations while our own cherished children seemed to have lost sight of the hope we instilled in them. "If Job weren't in the Bible," Craig says, "I probably wouldn't be a Christian." Quoting a long-forgotten source, Craig says, "I've done so much with so little for so long, I can do almost anything with nothing." These days, even with a drop in ministry donations reflective of the economic downturn, the "nothing" with which the Bogards make do tends to be more spiritual and emotional than material. Still, God provides. On the warm summer day when I visited one of Aslan's three urban day camps, longtime volunteer Brenda Bouldin served both snacks and Bible knowledge to a group of campers while Lethea "Queenie" Ferguson, Aslan's area program director, organized an outdoor game and the executive program director, Kat Eagles, pulled the threads together. Queenie says what's different about the Bogards is their passion for "kids nobody really wants or has time for." She adds, "Their heart for children takes priority over programs." Relationships always have been the heart of the ministry, according to Lynn Ann Bogard (left), who was in Philadelphia on the day I visited, straightening out passport issues in preparation for a youth mission trip to Aslan's affiliate ministry in Haiti. By phone she later told me that program-driven ministry puzzles her and that Aslan's success with kids has never been based on her or her husband having some intrinsic understanding of the African American experience. "We are not black and never will be," she says. "It's never had anything to do with things like that." She says their ability to transcend barriers "almost underscores that we don't have to be the same to care for others. We listen because we're related, not because we're the same." Much of what Lynn Ann contributes to the ministry nowadays depends on what needs to be done or what she feels competent to do. The 61-year-old says her lower profile is a result of both grief and age. Like Craig, she grapples with a spiritual conflict that, in the wake of her sons' deaths, she doesn't see ever ending "because there has been too much loss and what feels like betrayal." Still, her sense of calling is undiminished. "It's not based on how I feel or what I've been through or anything else. As confused and disillusioned as I can be, God's call is still written on my heart. Changing that would be like trying to take freckles out of someone's skin. It is part of who I am." I didn't meet Doug Eagles, Aslan's chief operating officer (and Kat's husband), on the day I visited because he too was preparing for the trip to Haiti by collecting donations for the personal hygiene kits that he, another adult, and nine teens would deliver. Aslan's work in the Caribbean nation, which began in 1996, was inspired by a youth mission trip that Daniél Bogard took to Uganda. 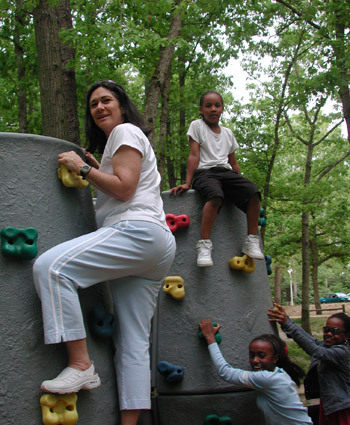 It has three unique goals: 1) to introduce urban young people to their African heritage and to the rich African culture of Haiti; 2) to acquaint young people from difficult home environments in the U.S. with the often more difficult situations faced by young people in other parts of the world; and 3) to offer them the opportunity to develop leadership and personal skills through humanitarian aid projects. In 2008, Craig told The New York Times that the only way he and Lynn Ann could emotionally survive the deaths of their sons is to be able to see their dream in Haiti become a reality. "Daniél and Dustin were the entire inspiration for it, pushing us every step of the way." Lynn Ann says the same is true for their continued ministry in New Jersey. Her sons believed in the work "with their whole hearts." Craig adds, "Both Daniél and Dustin struggled for years with substance abuse, but this is not what defined them. Ultimately, it was the drugs that took their lives away, but their lives were filled with service to Christ both in New Jersey and in Haiti. At the end, their hearts were just broken. What is discouraging is there still seems to be such a stigma attached to anyone with addiction problems." Earlier this year, talking about the Haiti work, Craig told the Asbury Park Press, "We teach kids that you learn to lead through serving ... to look beyond your need to others' needs." Not only do the Bogards model this value every day as they look beyond their own grief, but so do the Eagles, who joined Aslan full time after Dustin's death so that they could support the Bogards and help assure stability in the ministry. Lynn Ann says she and Craig couldn't have continued on without this young, energetic couple. Likewise, both Queenie and Brenda have been serving Aslan's youth for more than a decade each. I think God crossed my path with the Bogards' at just the right time. A week after I interviewed them, my husband and I volunteered once again to serve in our church's Vacation Bible School program. There was a charismatic young man who helped with the VBS music. He reminded me of my late son, and it hurt. At one point, I wondered if I could keep doing that type of ministry year in and year out. Then I thought about the Bogards, the Eagles, and Aslan's other volunteers, and I said to myself, "God will help me press past the pain." This article is reprinted with permission from UrbanFaith.com.